Russia’s President Vladimir Putin and Turkey’s President Recep Tayyip Erdogan did not even meet at the UN climate summit in Paris, which both attended. Instead, they made a number of harsh statements which, Russian commentators say, have left the two leaders with little scope for manoeuvre or reconciliation. The UN Conference of Parties (CoP) climate conference which opened in Paris on November 30 has been replete with political rhetoric not connected to the summit’s crucial agenda. Among the key side tracks was whether Russian President Vladimir Putin and his Turkish counterpart Recep Tayyip Erdogan would discuss the recent incident of the Russian bomber being shot down near the Syrian-Turkish border. Although Putin met with several other leaders and took part in a number of bilateral meetings, with the heads of state of the U.S.A, China, Germany, and South Korea, and the Prime Minister of Israel, he did not meet Erdogan. "We have not met," confirmed Putin, and then said Russia had received additional data about the incident with the Russian Su-24, which he claimed proved that the protection of the Syrian Turkmens is just an excuse for Turkey. "We have every reason to think that the decision to shoot down our plane was dictated by the desire to protect oil supply lines to Turkish territory," Putin said at a news conference after the summit. According to him, Ankara also failed to respond to Moscow's concerns about the free movement of terrorists as a result of the visa-free regime of the Russian Federation and Turkey (Russia has now abolished visa-free travel for Turkish citizens – Editor). "We have long asked them to pay attention to the fact that representatives of terrorist organizations that have fought and are trying to fight us with weapons in their hands in some regions of Russia <...> ‘surface’ on Turkish soil," the Russian President said. Erdogan did not hesitate to respond and said the same evening that he would resign if Putin’s allegations that Turkey is buying oil from the Islamic State (ISIS) jihadist organization are confirmed. 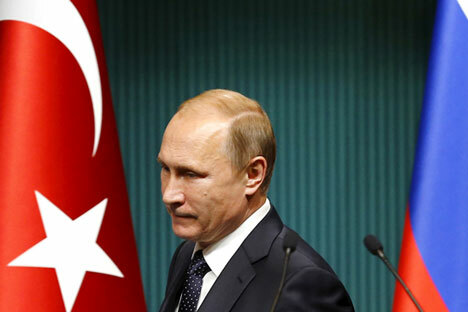 Putin claimed Ankara was concealing its oil purchases from ISIS. Erdogan claimed he was ready to resign if Russia's allegations were proven to be true. Russia and Turkey have severed political cooperation for the foreseeable future. The Russian-Turkish crisis is unlikely to affect the fight against ISIS in Syria, according to Russian commentators. It will be very difficult to restore the level of cooperation that Turkey had with Russia before the incident with the Su-24, as it was built through "considerable efforts" since the beginning of the 2000s, Leonid Isayev, an Arabist and a specialist in conflict monitoring, said in an interview. "Putin's harsh statement, which provoked rather harsh remarks from the Turks, is capable of burning bridges with each other for years," said Isayev, who believes Russian-Turkish relations will now wither. Such a confrontation is ultimately not favourable either for Russia or Turkey or NATO, of which Turkey is a member. In order to forget the rhetoric on the sidelines of the climate summit, "at the very least a change of regime" is required; such statements are being taken too personally in both countries. Vladimir Avatkov, an analyst of Turkey and director of the Centre of Oriental Studies, International Relations and Public Diplomacy, agrees that a change of regime in Turkey is the only realistic way out of the crisis, though he cautioned against equating the Turkish regime with the Turkish people. "Yes, the Turkish regime sided with terrorism when it shot down our plane, but we must think about the future," he said. Turkey is still unlikely to be forgotten as a promising partner. Will the estrangement between Russia and Turkey affect cooperation between various players in Syria? “What kind of broad coalition is it when they stab you in the back?”.. Nevertheless, Russia is still interested in the fight against ISIS and is cooperating with the French, so a deterioration in the fight against terrorism in Syria should not be anticipated. In fact, claims Nadein-Rayevsky, the situation has only improved. Moscow’s supply of S-400 air defense systems to Syria has radically changed the balance; the range of the radar systems covers almost all sectors of the front; the Turkish aircraft prefer not to intrude into the range of the radars and are now reluctant to bomb areas where Syrian Kurd units are located. "The Turks used to bomb them almost every day, but these units are actually very effective in fighting the Islamists on their territory," said Nadein-Rayevsky. Moreover, in his opinion, if the actions of Turkey strongly interfere with the partner countries' joint struggle against ISIS in Syria, NATO might try to push Ankara away from this process. "The situation in Syria is tense as it is – if the conflict between Russia and Turkey escalates there as well, it will only work in the favor of ISIS," said Isayev. "The alliance will take the side of the Turks, as was the case with the bomber, but they will do everything possible to prevent the parties from getting into a sharp confrontation."